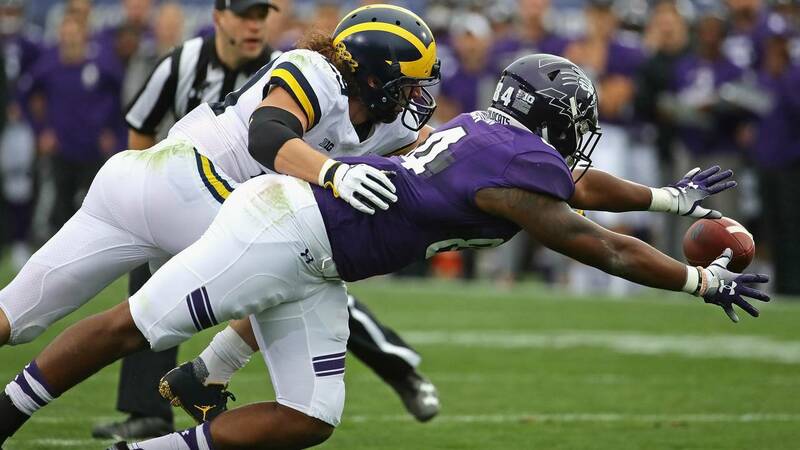 Should Michigan football fans be concerned after unimpressive game at Northwestern? 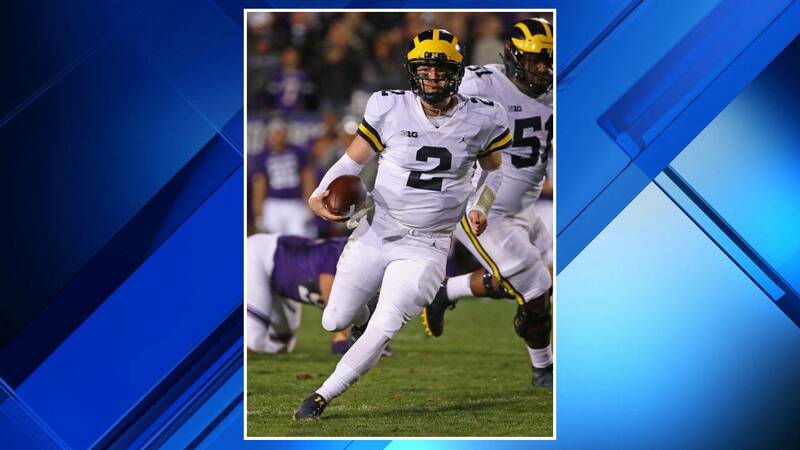 ANN ARBOR, Mich. - When the Michigan football team traveled to Northwestern coming off three straight blowout victories, fans hoped for confirmation that the team they saw in the opener was gone, and the team they hoped to see had arrived. Instead, they went to bed Saturday night knowing less about their team than when they woke up. Michigan's first half at Northwestern was almost a carbon copy of its opening half against Notre Dame. In South Bend, Michigan gave up three scores in the first four defensive possessions and trailed by 18 points. In Evanston, Michigan allowed scores on Northwestern's first three possessions and trailed by 17. The Wolverines trailed Notre Dame by 11 at halftime, and Northwestern by 10 at halftime. In both games, Michigan's offense came out of the gate struggling to move the ball and the defense couldn't get stops on third down. Michigan entered both games ranked No. 14 in the country, and fell in the rankings after both outcomes. The major difference: When Michigan got the ball in the final minutes against Northwestern, the offense found a way win the game. Should Michigan fans be concerned about the performance, even though Jim Harbaugh's team escaped with a victory? On a national level, experts around the country certainly believe there's cause for concern. Despite winning a Big Ten game on the road, Michigan dropped in both major polls. Stanford, which got blown out by 21 points in an environment where Michigan lost by just seven, stayed atop the Wolverines in both polls. Kentucky jumped Michigan in the polls, and basketball season hasn't even tipped off yet. 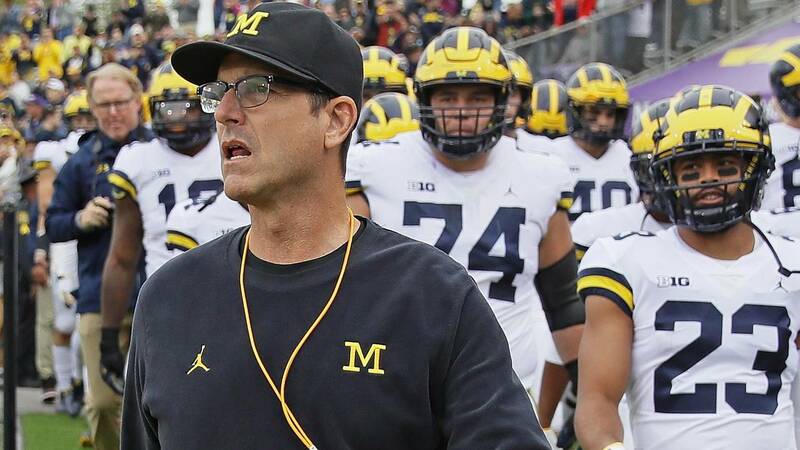 It's the pollsters' job to react to each weekend's games and submit their rankings accordingly, but beyond the top 25, there are clear reasons to worry about Michigan's performance. This is nothing new for Michigan fans, who have watched the team struggle on the road for more than a decade. In five games this season, Michigan has looked like a top-10 team three times -- all at home. Road games have been a completely different story. Yes, Notre Dame and Northwestern are the two best teams Michigan has played so far, but even Akron scored 39 points against the Wildcats. 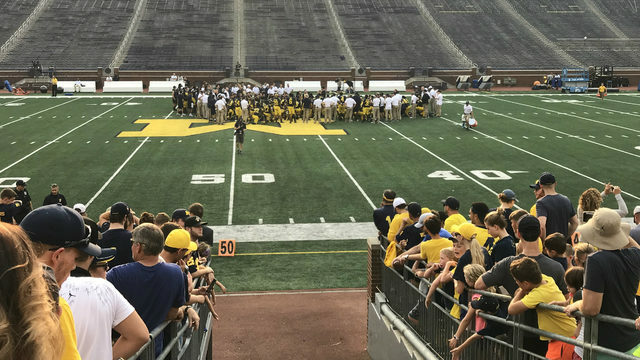 Michigan's season will be defined by road games. In fact, it already has been. 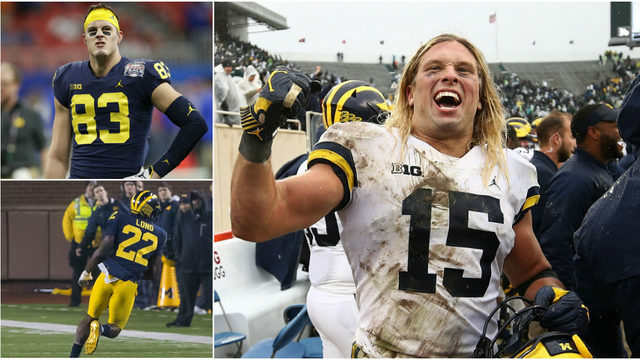 If the Wolverines had won the opener, they would likely be considered among the top teams in the nation and a College Football Playoff contender. Games at Michigan State and Ohio State are still on the schedule, and those are teams Michigan has struggled against no matter the venue. If the Wolverines get off to slow starts in those games, they won't be able to come back from three-possession deficits. Another theme for Michigan under Harbaugh has been the ability to run the ball effectively against poor defensive teams, but struggling in big games. In its five losses last season, Michigan rushed for 2.8 yards per carry or fewer. The Wolverines rushed for more than 4 yards per carry in every win except the Purdue game, averaging more than 5 yards per carry in half of its wins. The rushing numbers against Notre Dame were alarming, as the Wolverines averaged just 1.8 yards per carry -- though sacks played a role in that final number. Then, Michigan averaged 8.8 yards per carry against Western Michigan, 4.8 yards per carry against SMU and 6.3 yards per carry against Nebraska. Harbaugh hoped the running game had turned a corner. But that wasn't the case against Northwestern, as Karan Higdon averaged 3.8 yards per carry in 30 attempts. The team averaged 4.3 yards per rush, but that was aided by a 25-yard run from wide receiver Donovan Peoples-Jones. If you take out that play, Michigan averaged fewer than 3.8 yards per carry as a team. This is a problem that has to be addressed. Sure, Michigan has gotten a raw deal on a few calls this season, but most teams in the country face some officiating adversity. 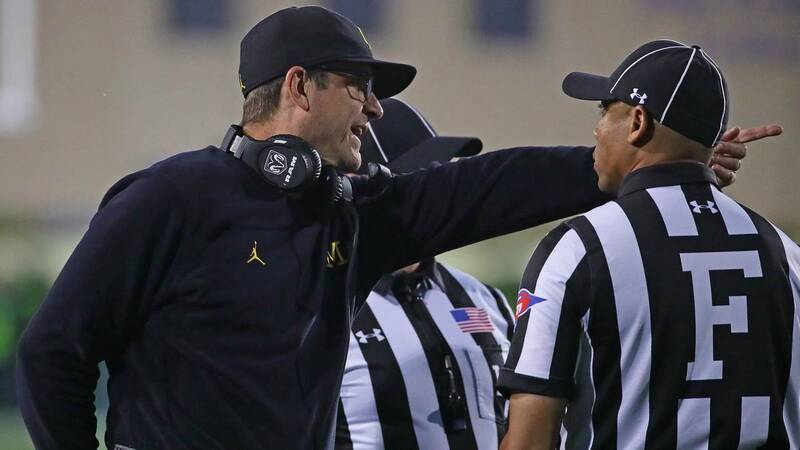 Regardless of whether Michigan has deserved every flag that's been thrown -- Higdon would certainly disagree -- there's no denying penalties are a major issue. Last season, Michigan ranked 95th in the nation in penalties committed and 84th in penalty yards per game. It's gotten even worse in 2018, as Michigan has committed 9.2 penalties per game for an average of 84.2 penalty yards -- good for 121st and 119th in the nation, respectively. Michigan was only flagged seven times for 52 yards in the opener, but the penalties were extremely costly and extended eventual Notre Dame scoring drives. The Wolverines were called for an incredible 13 penalties in the SMU game, gifting the Mustangs 137 yards. Flags almost doomed Michigan again Saturday, as 11 penalties for 100 yards aided Northwestern's struggling offense and handicapped Michigan's scoring chances. Holding calls and pre-snap penalties on offense have been problematic, but the most glaring issue is Michigan's secondary. The Wolverines have been called for too many defensive holding and pass interference calls, primarily on critical third-down plays. Those don't count as turnovers, but they essentially have the same effect, as teams continue drives that otherwise would have ended in kicks or punts. For the first time since transferring to Michigan, Patterson had to use his legs to save the offense in the second half. It began on the team's first drive of the second half when, down 10 points, Patterson scrambled for 12 yards on third and six to extend the possession and get into Northwestern territory. On the following play, Patterson hit Nico Collins for a 36-yard pass to the Northwestern 10-yard line. Michigan got the ball back three possessions later down four points with 10 minutes left in the game. As the quarter wound down, Patterson faced another critical third down and six. He took matters into his own hands again, running for nine yards and a first down. Four plays later, Higdon found the end zone for the game-winning score. Patterson's final run of the game came on another third down and six, as Michigan was trying to run out the clock. 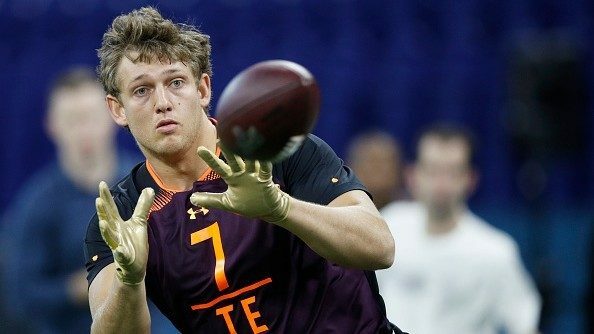 He gained eight yards and a critical first down. If Michigan had failed to convert, Northwestern would have had 2:50 left on the clock for a possible game-winning drive. Instead, Michigan punted the ball back with 34 seconds remaining. Patterson doesn't have to be Denard Robinson to make a difference as a running quarterback. His ability to get positive yardage on a broken play is a huge advantage, and even the threat of a quarterback run adds a new dimension to the Michigan offense. Since the disastrous showing against Notre Dame, Michigan's offensive line has been noticeably better at protecting Patterson in the pocket. While he helped the cause by scrambling against Northwestern, he was still only sacked one time for the third straight game. Ed Warinner's group was called out after allowing three sacks and six quarterback hurries at Notre Dame, but it has responded well to the challenge. Since allowing two sacks against Western Michigan, the offensive line has allowed three sacks in three games, and Patterson was only hurried three times against Northwestern. Michigan hasn't faced a dominant defensive line since the opener, but it's promising that the line has taken care of business against weaker opponents. Perhaps the strongest argument against panicking over Michigan's performance at Northwestern is the fact that the Wolverines were in complete control after the opening moments. Other than the massive penalty disparity -- Northwestern was only called for two penalties -- Michigan was dominant in most phases of the game. Michigan outgained Northwestern 376-202 overall and held the Wildcats to 28 yards rushing on 34 attempts. The Wolverines tallied six sacks and 10 tackles for loss and won the time of possession battle by more than nine minutes. After scoring on its first three drives, here's a look at every Northwestern possession through the end of the game. There's no denying Michigan was a much better team, but that has been the story in a few losses under Harbaugh. It's a positive sign that Michigan is outplaying teams consistently, but those games have to turn into wins. Against Northwestern, Michigan did just enough. Michigan has one more game in a favorable five-week stretch: a home date with Maryland. The Wolverines haven't had any trouble at home, especially against teams with less talent, as will be the case this weekend. If Michigan can survive the Maryland game, it faces one of the toughest three-game stretches for any team in the nation. Home games against Wisconsin and Penn State will sandwich a critical road trip to East Lansing. The road test against Michigan State stands out because of Michigan's struggles outside Ann Arbor. The country will have a much better understanding of Michigan in a month.